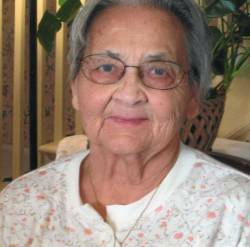 St. Albans – Helen M. Church a lifelong resident of this area, passed away on Saturday, September 23rd, 2017, at the home of her son, surrounded by her family. Born in St. Albans, on September 22nd, 1935, she was the daughter of the late Howard and Elizabeth (Bellevue) Bushey. Helen was 82 years old. On October 29th, 1955, in Georgia, she married Arnold Church, who pre-deceased her on August 24th, 1986. Helen was employed Ogden Services at IBM, was a longtime communicant of Holy Angels Parish, a former foster grandmother and enjoyed knitting. Survivors include her daughters, Mary Raymond (Larry) of St. Albans, Carolyn Raymond (Joe) of Richford; her son, Lynn Church (Wanda Joyal) of St. Albans, as well as eleven grandchildren and twelve great-grandchildren. She is also survived by her siblings, Roland Bushey (Delores) of Wichita, Kansas, and Jennie Walters of Florida and several nieces and nephews. In addition to her parents and husband, Arnold, Helen was predeceased by her son, Roger Edward Church in 1966; brothers, Harry and Homer and her sister, Ida Bushey. Helen’s family will receive friends on Wednesday, September 27th, 2017, from 11:00 A.M. to 12 Noon at the Heald Funeral Home, 87 South Main Street, St. Albans. A funeral service will follow at 12:00 Noon in the Heald Chapel with the Reverend Maurice J. Roy, Pastor of Holy Angels Parish officiating. Interment will follow in the Church family lot in Mount Calvary Cemetery. To send Helen’s family a written expression of sympathy or share a memory, please go to her on-line guest book at www.healdfuneralhome.com.